There are lot of latest technology Android phone comes in to the market, but when you don’t have battery you are not able to use your phone. In Android 5.1 Lollipop there is an interesting battery saver feature added by the mobile manufacture companies. In this article we have to discuss how to use battery saver mode Android phone 5.1 Lollipop. There are lot of tips and tricks which help to improve Android smartphone battery life. You can use these tricks to increase your phone battery. Lot of Android phone users complain about not charge his phone battery properly. Now, there is no need to worry you can quick charge Android phone batter by using few tips and tricks. Most of the novice user don’t know about the battery save mode on Android phone. But after reading this guide you can easily enable and use battery save mode on Android 5.1 Lollipop. You just have to take few easy steps to enable or use battery saver mode Android phone. Tap on the “Settings” option on your Android 5.1 Lollipop. Now, tap on the “Batter” option which is placed in the “Device” category on your phone. Tap on the three dots which is placed on the top right corner of batter window. Turn-on “Batter saver threshold” mode by tapping on this option. You also have another choice to change the battery mode. By default your batter mode is set on the “Balanced” option. You can change it manually on “Power save” option as per your requirement. 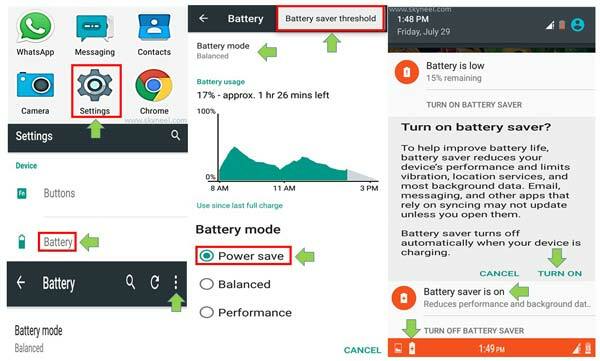 I hope after reading this guide Lollipop users can easily use battery saver mode Android phone. There are lot of ways from which you can increase the performance of your battery life. If you have any query regarding this guide please write us in the comment box. Thanks to all.